If you play word association with me and you say Universal, I think of Universal Pictures first, especially their older logos which were fantastic. One is pictured at the top of the post. Of course I know what the word means. When I was working on the Dr. Marcus’ Universal Bitters post yesterday, I came across some additional Universal Bitters. 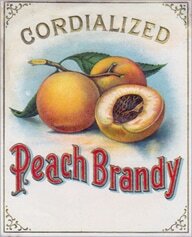 I thought we would take a moment to look at a few of the brands dating from 1860 all the way to 1931. 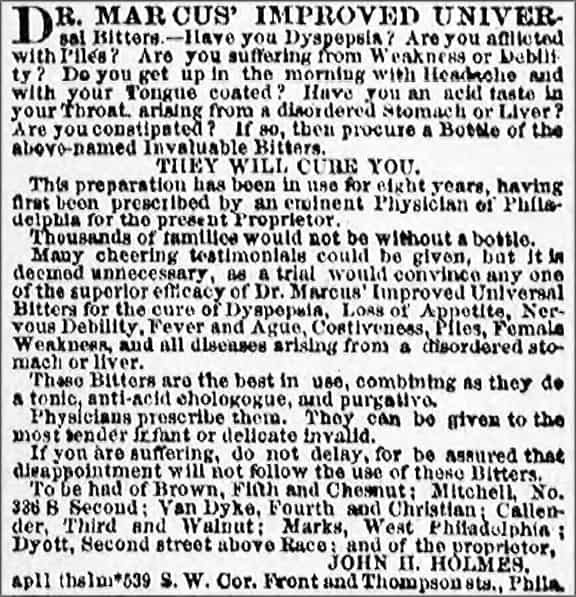 First the Dr. Marcus’ Universal Bitters advertisement below from the The Philadelphia Inquirer, in 1861. The classic Universe Bitters lady’s leg has not been included in the post. John H. Holmes was the proprietor in 1861, addressing at 539 S.W. Corner of Front and Thompson Streets in Philadelphia. The advertisement below states that the “preparation has been in use for eight years, having first been prescribed by the eminent Physician of Philadelphia for the present Proprietor”. Unfortunately I can not find a Dr. Marcus in Philadelphia directories in the 1850s or 1860s. Holmes was selling the bitters out of his Tavern at the same address. 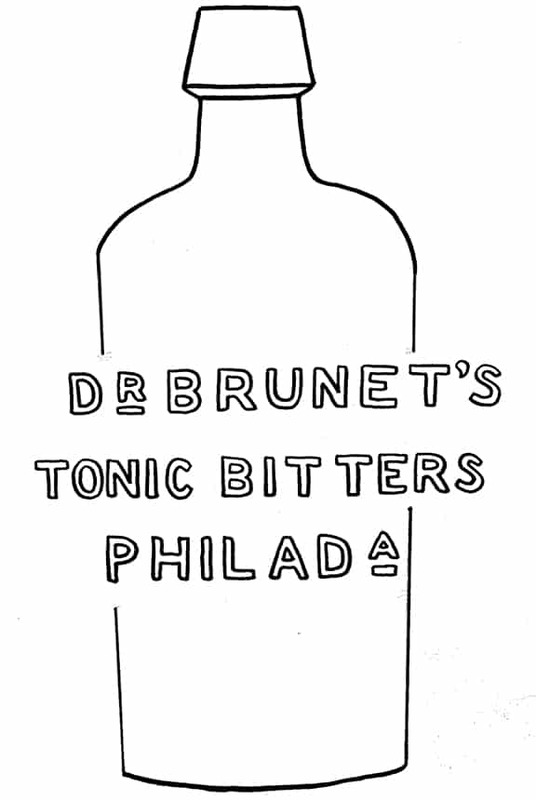 Read: Dr. Marcus’ Universal Bitters – Philadelphia. The Ring & Ham number is M 35. H.G. 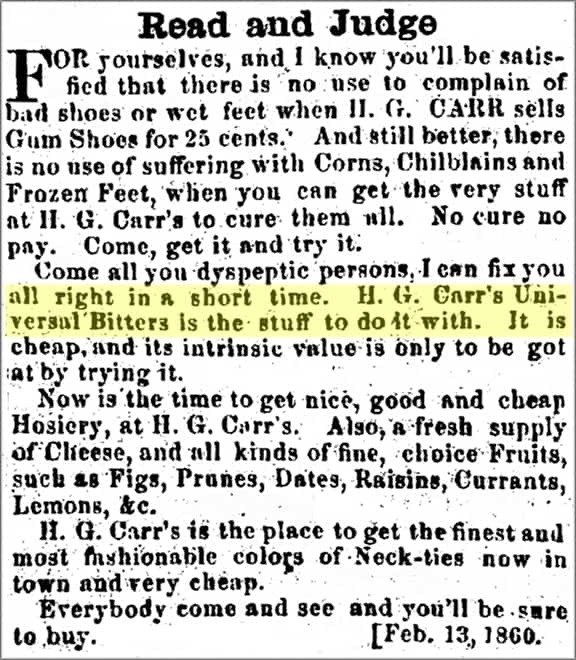 Garr must have operated a general store in Gettysburg according to the advertisement below in the Gettysburg Compiler in 1860. Along with H. G. Garr’s Universal Bitters, he was selling Gum Shoes for 25 cents for wet feet and all kinds of cures for people suffering with corns, chilblains and frozen feet. This cure was probably his Universal Bitters. 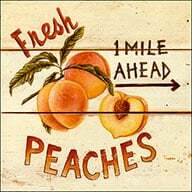 He also sold hosiery, fresh cheese and all kinds of choice fruits like figs, prunes, dates, raisins, currants and lemons. This brand appears unlisted in Ring & Ham. Gettysburg would play an important role in United States history in just a few short years. George Myers at 11 and 13 South Front Street in Wilmington, South Carolina was the agent for Universal Bitters in the The Daily Journal in 1875. This was probably a reference to the Universal Bitters put out by Nicholas Kieffer in New Orleans (see further below). 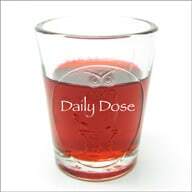 The bitters was a positive cure for nervous debility. Dr. Brunett was born in France around 1805 and came to New York with his new wife in 1827. He lived in New York ten years until his wife died. He came to Philadelphia with his two daughters and opened a small drug store at 534 South Fourth Street. 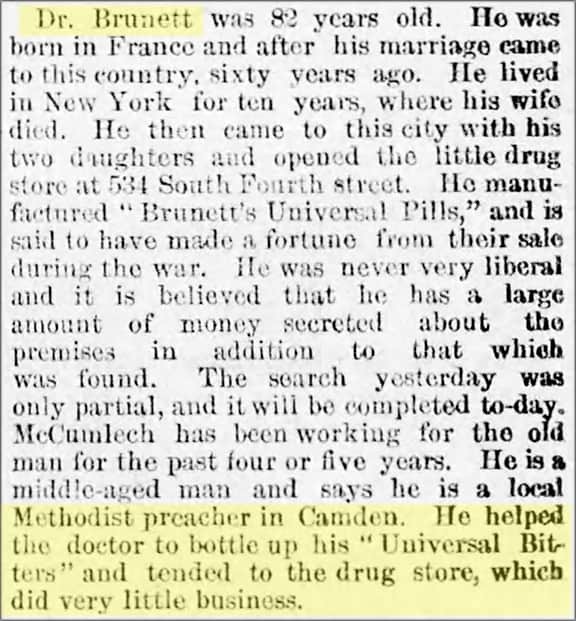 He manufactured Brunett’s Universal Pills and Brunett’s Universal Bitters. 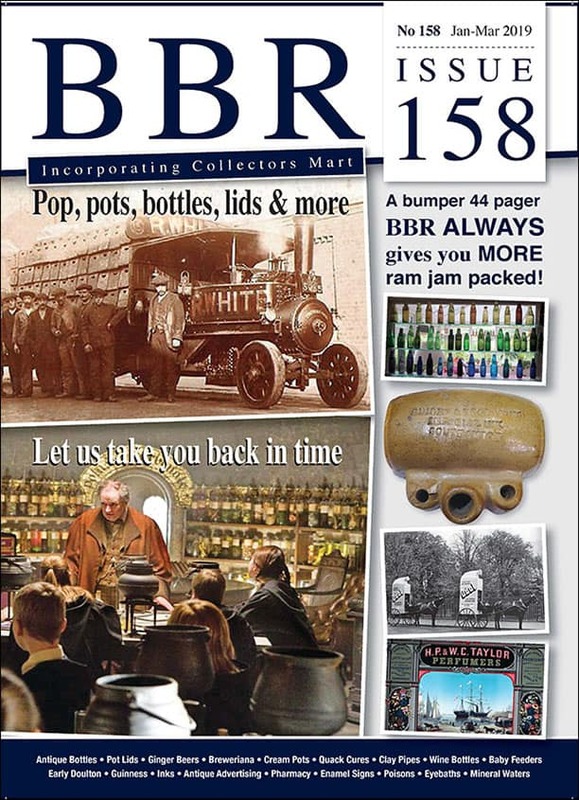 Brunett’s Universal Bitters is unlisted but there is a listing in Ring & Ham for a B 238, DR. BRUNET’S TONIC BITTERS from Philadelphia. 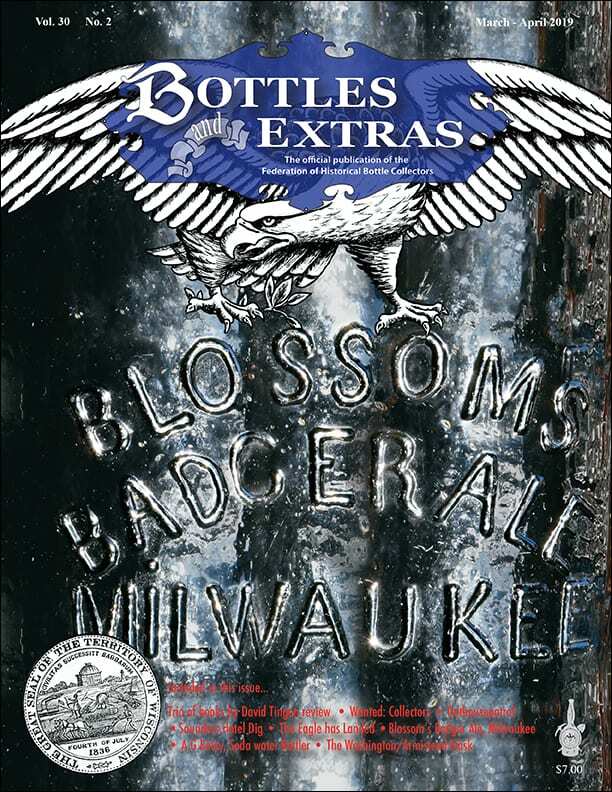 The bottle is 7 5/8 tall, round, aqua and has a rough and metallic pontil mark. Probably the same guy though the last name is missing a “T’. When you say Universal Bitters, this is the one, the creme of the crop. 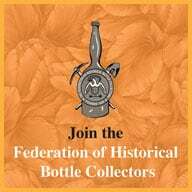 We have talked previously about Nicholas Kieffer who made his Universal Bitters in New Orleans. 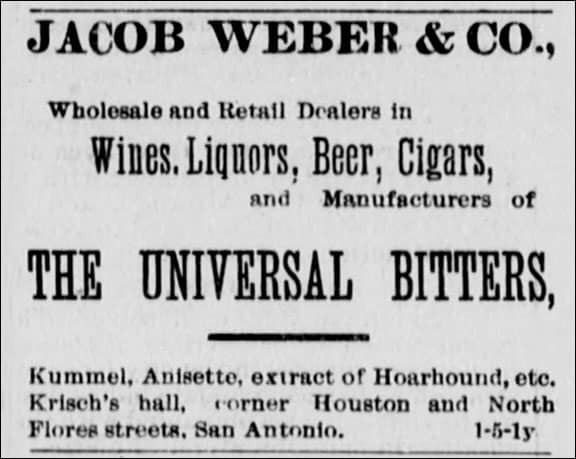 Later H. Grenet, F. Krisch & Brother and Jacob Weber & Company made and sold it in San Antonio, Texas as you can see in these newspaper advertisement below from The San Antonio Light in 1882 and 1884. Read: The missing link Universal Bitters by Nicholas Kieffer. This would be Ring & Ham number U 11.2. 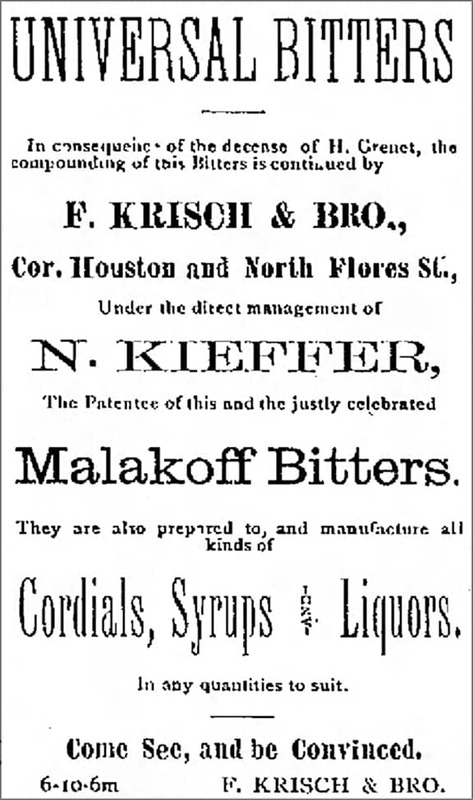 Notice that Krisch is also selling Kieffer’s Malakoff Bitters. The story here revolves around Silas Burrell Stiles and Frank M. Givens who were born in New York and ended up in Fond du Lac, Wisconsin and opened a drug store in 1873. I suspect they were life-long friends as their wives, Caroline and Isabel, appear together on social listings during the same time period. Silas was the main driving force in the initial drug business. They put out the Dr. Warren’s Universal Tonic Bitters around 1885. 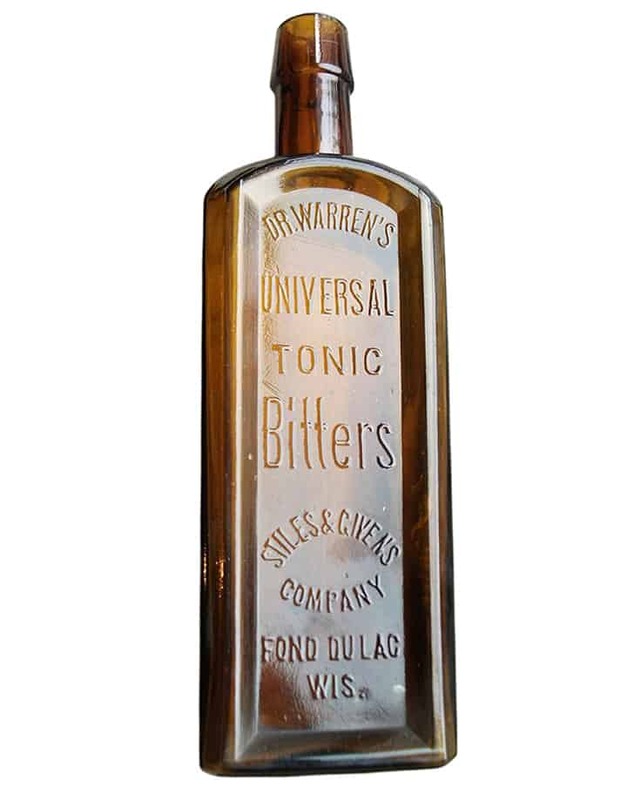 Read: Dr. Warren’s Universal Tonic Bitters – Fond du Lac. This bitters is extremely rare and cataloged as W 50 in Ring & Ham. 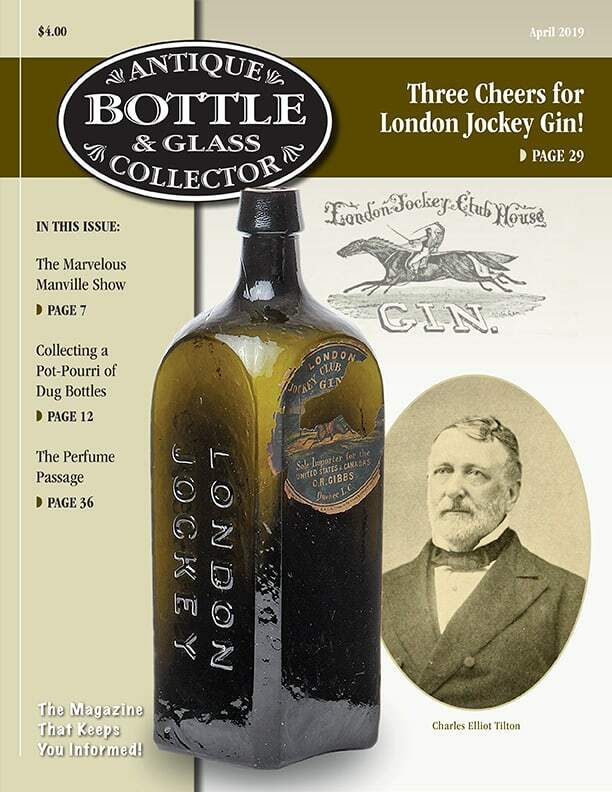 Goldmann’s famous Universal Bitters was selling and looking for Agents for his medicinal preparation that “was not subject to license, therefore salable in prohibition as well as other States”, I like his phrase “Big money in it for live people”. He was addressed at 403 Blue Island Avenue in 1886 and 122 Wells Street the next year. See the next listing for Albert Goldman in New York below. This brand appears unlisted in Ring & Ham. 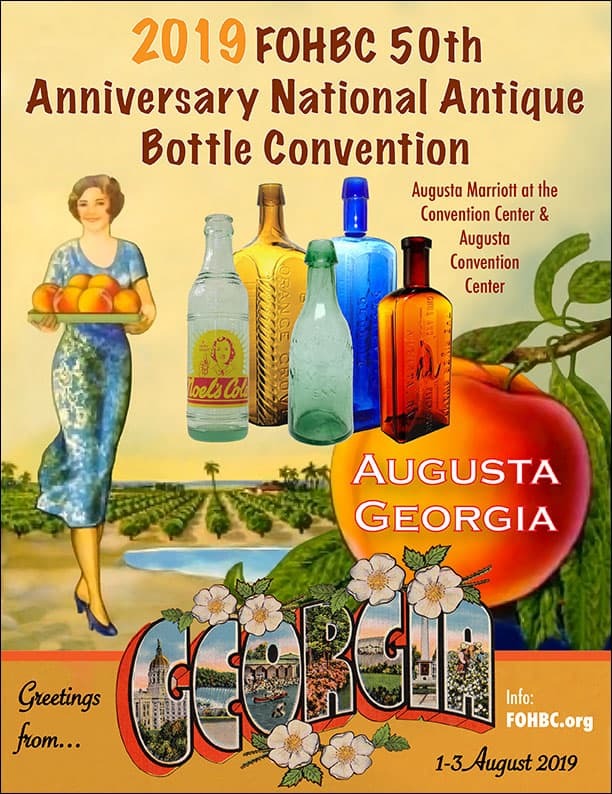 Union Bottling Works were manufacturers of soda water, ginger ale, champagne, cider and orange wine. 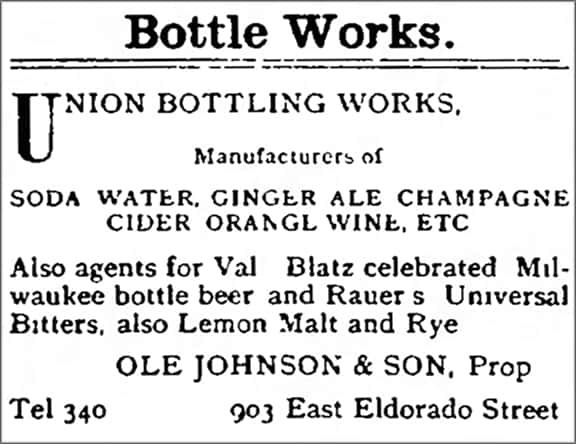 They were also the agents for Rauer’s Universal Bitters according to this 1890 advertisement below in the The Daily Review in Decatur, Illinois. This brand appears unlisted in Ring & Ham. Henry Scheriff of St. Louis was the sole proprietor of the Universal Bitters Chemical Works as noted in this 1890 advertisement below from the Alton Evening Telegraph in Alton, Illinois. This bitters reference appears unlisted in Ring & Ham. 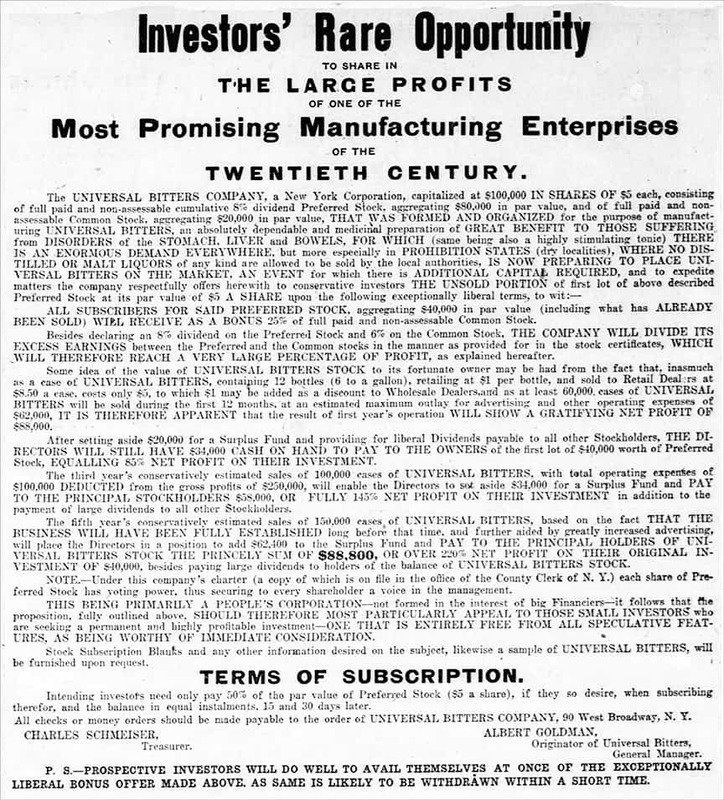 The Universal Bitters Company, a New York Corporation, posted notices and gave investors an opportunity to “Share in the Large Profits of one of the Most Promising Manufacturing Enterprises of the Twentieth Century” in the New York Tribune in 1908. Albert Goldman was the originator of Universal Bitters. He was addressed at 90 West Broadway in New York City. This bitters company reference appears unlisted in Ring & Ham. 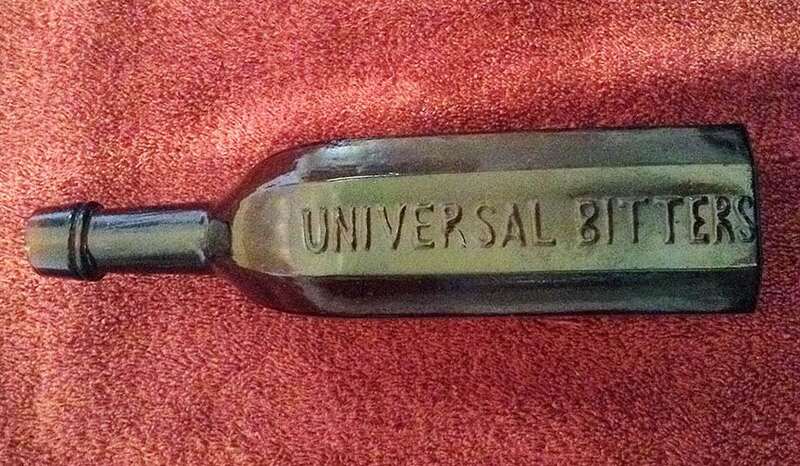 Universal Bitters, in this 10 Day Special Sale is still being sold at a Cut-Rate Drug store in 1931. Amazing. It was originally listed at $1.25 a bottle and was marked down to 79c. 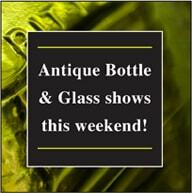 I’m sure some screw-cap concoction. This entry was posted in Advertising, Bitters, Druggist & Drugstore, History, Questions and tagged bitters, Brunet, Brunett, chicago, Decatur, Fond du Lac, Garr, Gettysburg, Goldman, Goldmann, Greenville, Holmes, illinois, Kieffer, Krisch, Louisiana, Marcus, Myer, New Orleans, New York, North Carolina, Pennsylvania, Philadelphia, Rauer, San Antonio, Scheriff, St. Louis, texas, Universal, Warren, Weber, Wilmington, Wisconsin. Bookmark the permalink.